Available direct at just under the magic £250, this amp’s tweed magic at a bargain basement price - check it out! Well priced and well made. 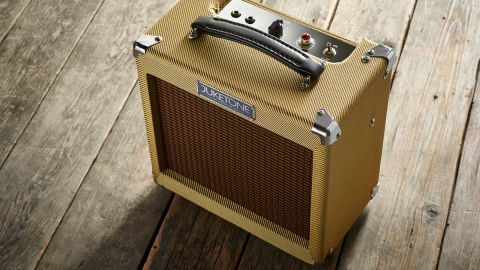 The original tweed Fender Champ of the 1950s was intended as an entry-level student amp. However, the thick, multi-layered overdrive that happens when it’s turned up to 12 soon ensured Fender’s small combo would find a natural niche in the recording studio, where it’s been used to create countless iconic guitar tracks. Hardly surprising, then, that the simple circuit is a favourite with homebrew enthusiasts, especially as boutique-type replicas (including Fender’s own) are expensive, though it’s still cheaper than buying a beat-up and often poorly maintained 1950s original. But high-voltage electronics aren’t for everyone, so there’s a need for tweed at a more affordable price point, and that’s capably addressed by Juketone, with a Chinese-built range that includes proper valve-rectified replicas of all the most popular tweed amps, including this one: the True Blood, a reproduction of the legendary 5F1 Fender Champ. The True Blood’s solid ply cabinet is covered in tweed to a decent standard and it looks the part, even if the dimensions and fabric-covering methods aren’t exact copies. Underneath the chrome-effect control panel there’s a robust steel chassis with welded corners. The True Blood’s solid ply cabinet is covered in tweed to a decent standard and it looks the part, even if the dimensions and fabric-covering methods aren’t exact copies. Inside, this is a real point-to-point hand-wired circuit using a small GRP eyelet board with hand-wired valve bases, switches and sockets. The tough chassis, clean soldering and neat wiring indicates it’s been put together by people who know what they’re doing, although there are a few minor differences: the top-mounted fuse holder has disappeared and the power light is an LED rather than an incandescent bulb. The preamp and power valves are a 12AX7 and a single 6V6, while the original’s 5Y3 rectifier valve has been replaced with a Chinese 6Z4, similar to American/European 6X4/ EZ90 rectifiers but with a different pin-out, so it’s not directly interchangeable. The True Blood’s control panel is simple, with a pair of input jacks and a single volume knob, which goes up to 12. Behind the brown grille-cloth is a single Celestion eight-inch speaker, connected by a pair of wires with tight crimp connectors. Overall, it’s a strong and good-looking amp for the money, which should last for a long time. The Juketone sounds warmer and somewhat politer than the original. It’s also very well-behaved electrically, with practically zero hum and hiss. Used with single coils or humbuckers, you’ll get plenty of tweed mojo, although for some styles the True Blood could do with being a little ruder. With just a volume control, you need to work the guitar to get the best from it, using different picking positions and dynamics, and rediscovering the power of the guitar’s tone control - a little challenging at first, but very rewarding when it comes together. The True Blood is a fair replica of the Champ, if a little too polite. However, the price is tempting enough to sway anyone.